29 February (leap day and huge failure of Azure Cloud) is the day then VS2011 Beta community preview has been released. As a lot of geeks around the globe I’ve downloaded installation image and tried it on my computer. With VS2011 Beta we also received .NET 4.5 framework and (drums here) - ASP.NET MVC4 Beta, that I really wanted to try since first CTP is out. I would not say I spent too much time with both products, but I already have some initial opinion on that. Well, I had some not really good experience with beta versions of VS2010 and compatibility between two visual studios on the same machine. Situation is different with VS2011. Installation very pretty smooth, I just run it on background while was working through RDP on another machine and it installed without any interaction. Whole process took about 40 minutes. VS2010 and VS2011 beta could happily leave together without any interference. Moreover, you can freely work with your existing VS2010 solutions. Solutions for .NET 4, 3.5 and 2.0 are still supported in the same good way. VS2011 “cold” start up is a faster (about 40 seconds against 90 seconds, on my machine). The only one reason I see is VS2011 is not yet overloaded with different plugins I use in VS2010. First very noticeable change is of cause the design. There were many blog posts with preview of VS2011 design before the beta release. And you know, I really liked what I saw on images. I changed my opinion on first launch. Probably it’s just the matter of taste or habits, but new VS design looks awful to me (especially in Dark Theme - 80’s monochrome display back!). It’s totally grey, with no colors in icons at all. Fonts are in METRO style (all uppercase) looks very unusual. Solution explorer contains grey icons, it’s a little difficult to distinguish between project types and file types inside. So, fellow developer - get ready to order new glasses since you decide to switch to VS2011. Nevertheless, I was happy to open my exiting solution, press Ctrl + Shift + B and it successfully built. The good thing is .sln file has not been transformed (except the Format Version 11.00 has been changed to Format Version 12.00) so it’s still can be opened both VS2010 and VS2011. It also has been imported all my VS2010 settings. It is really nice, since you don’t need to spent much time setting up favorite color scheme and key bindings. I haven’t seen any noticeable performance changes. Sometimes VS2011 works a little slower as for me (please note, this is only subjective feelings, does not pretend to be absolute truth). 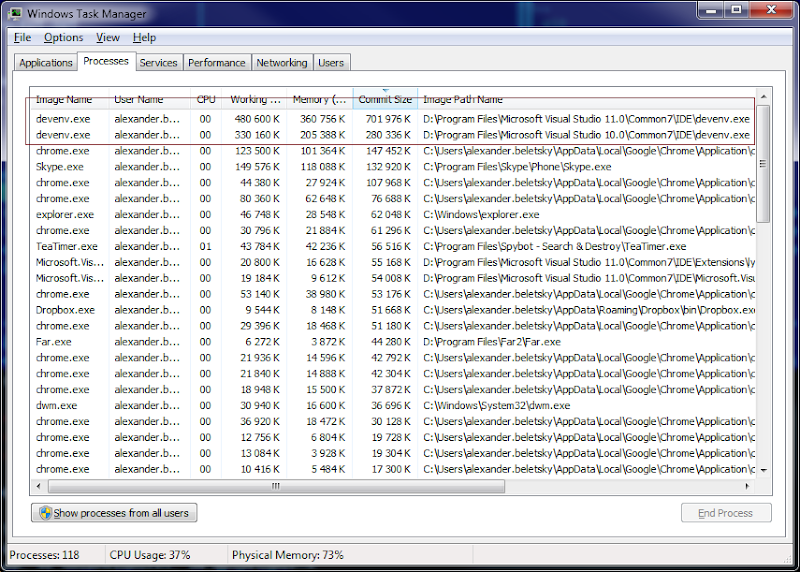 Looks like VS2011 has much larger memory footprint. And for some mystical reason it spawns second devenv.exe process in a while, even if I have only one VS instance running. Code editor is almost the same. No new refactoring tools, no support of 3rd parties Unit Test systems (NUnit, XUnit etc.) from the box. Still Visual Studio requires to have ReSharper for more productive coding. My dream of using clean VS with minimum plugins installed seems not gonna come true with VS2011. Some few nice moments I noticed for HTML/Razor/CSS editors. First of all, it updates closing HTML tag if you changed opening one (and vice versa). For CSS, it has much more better InteliSence + nice feature of picking colors. I haven’t noticed any significant changes to JS editor. Except the fact, that there are no ‘Update JScript Intellisense’ menu command, so I suppose that now it’s done automatically. Still, it’s very primitive and does not work all the time. For instance, I haven’t managed to get any InteliSense during working with Knockout.js library, maybe I’m just doing something wrong. So, VS2011 is generally OK, so I would prefer to use it. Hope a lot of new fixes and some feature still will be included in RC. What I personally lack is 2 plugins. ReSharper and NCrunch. Fortunately both appeared very fast. Remco Mulder released NCrunch 1.38b and JetBrains are came with ReSharper 7 EAP which is free for download and evaluation. Both plugins works really fine. Having good refactoring tools as ReSharper gives and having the power of Continuous Tests with NCrunch, makes the VS2011 ready to use IDE. The beta looks very promising.. and in general it works fine! Except the design, nothing really new to IDE as for me. Probably I spent to few time to feel the power, so I’ll be updating if I see some cool or bad features. The most sweet things with new VS is surely updated .NET framework and MVC. I’m now trying to play with new stuff and much as I can, already checked some new nice stuff of MVC4 framework.